CD Business Card Development. What is a digital Business Card CD? "The Perfect Way To Leave Your Clients With More Than Just a Name." A business card CD is as it sounds. It is a CD that is slightly bigger than an actual printed business card, but in digital format and can contain up to 50mb+ of content for any of your particular promotional or marketing ideas. 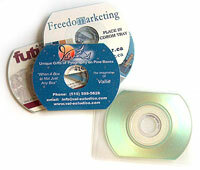 Digital CD business card cd labels are actually printed or silk screened with image/information of your choice. Many businesses view cd digital business cards as a great opportunity to present their website to clients. CD Business cards offer the opportunity for development of interactive multimedia presentions to enhance traditional marketing promotional media kits. A CD Business Card (also known as BIZ card) is a revolutionary approach to marketing and often considered one of the most exciting promotional developments of the decade!! Why? Around the world countless meetings take place everyday. Your clients and potential customers have busy schedules. Sometimes it is hard to get your message through. It is important to make a lasting impression in the valuable time that they do give you. Imagine supplying a CD Business Card which shows your entire business operations using an interactive multimedia presentation, with video, graphics, music and voice narration - all at a fraction of what traditional marketing would cost! Regardless, if you are meeting one-on-one with the owner/president of a small company or if you are meeting with the board of directors of a large corporation, A CD Business Card can give you the edge to make that impression the best it can be. There are so many benefits to CD Business Card products that it can actually cost you money if you don’t make the investment. Learn about these benefits…. What Can Be Included On a CD Business Card (BIZ Card)? What Are The Steps Involved In Getting A Business card CD Rom? You first need to decide the content that would best serve your needs. (A lot of companies provide their website on their cd business card). As with a traditional paper business card, you would determine the content for the front label of the Biz Card CD Rom. Our experts can generate any or all of the above content and front imaging for the CD. Quantities are available from 50 - 10,000+. We then duplicate your digital cd, apply business card cd labels, insert into a plastic sleeve and deliver to you within 5 - 10 business days. CD Rom Business cards can fit nicely into your existing marketing plans. Whether you are a small business or a large corporation, the benefits and opportunities available through digital business cards are very rewarding!! We are here to service the Canadian (Ontario) market and assist you with all your marketing and communications design needs. Be sure to contact us with any questions. We provide free estimates as well as a free one hour consultation.